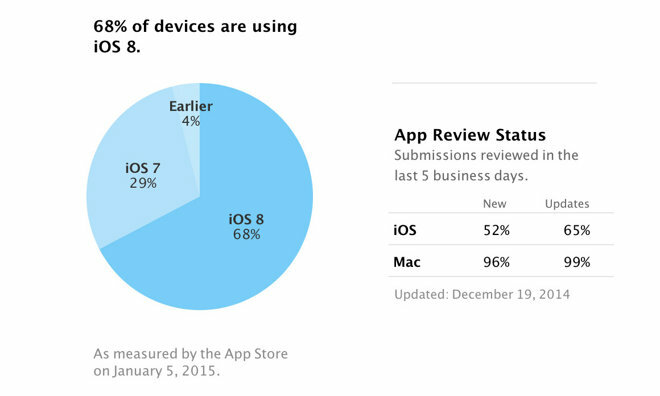 According to the latest statistics from Apple, distribution of company's iOS 8 mobile operating continues to plod along and is now installed on 68 percent of iPhones and iPads registered to the iOS App Store. While it's not setting any records, iOS 8 adoption is steadily rising and now accounts for 68 percent of iOS devices linked to Apple's App Store, up 8 percent from statistics reported in late November. Apple posted the latest numbers to its developer website on Wednesday. Unsurprisingly, older iOS versions saw respective shares decrease over the same time period, with iOS 7 decreasing from 35 percent to 29 percent, and iOS 6 or below moving from 5 percent down to 4 percent of App Store registrants. The consistently rising share of iOS 8 users suggest new device sales are moving the needle helped along by a trickle of late upgraders. In early October, iOS 8 adoption saw a brief period of stagnation after a buggy iOS 8.0.1 update inadvertently disabled cellular connectivity and Touch ID for iPhone 6 and iPhone 6 Plus owners. The slowdown followed an initially strong uptake typical of Apple's major platform releases. Distribution picked up when Apple released iOS 8.1 in October, activating touchless Apple Pay transactions for iPhone 6. The most recent iOS 8.1.2 update was released in December to rectify an issue concerning missing iTunes ringtones, as well as patch security holes.